This pair of lazuli buntings was photographed by Robert Shantz at George Walker House, Paradise, Arizona. The mostly brown female is on the left and the namesake male on the right. Lazuli Buntings begin fall migration as early as late July from their spring and summer breeding grounds in the northern States and Canada. When they arrive in Arizona's sycamore canyons in August they are arriving at peak productiviity of seeds and insects. By late fall they will arrive in the Neotropics. 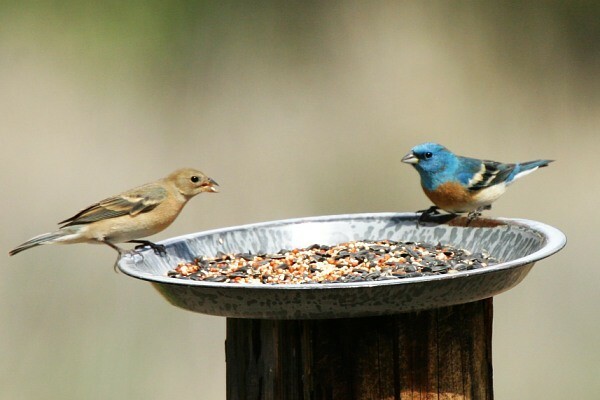 They are pleased to stop at seed feeders provided by human inhabitants of the Arizona. Generally absent in summer and winter.